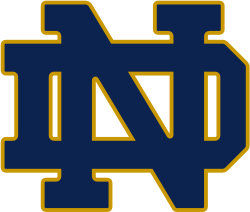 The 2002 Notre Dame Fighting Irish football team was the college football team that represented the University of Notre Dame in the 2002 NCAA Division I-A football season. The team was coached by Tyrone Willingham and played its home games at Notre Dame Stadium in Notre Dame, Indiana. The 2002 season became known as a "Return to Glory" for the Irish. This phrase appeared on a student shirt that created a "Sea of Green" in the Irish stands. It was picked up by many in the media and was used on the front cover of Sports Illustrated. Despite not scoring an offensive touchdown in their first two games, the Irish won both, and in the process made Willingham the 24th Notre Dame head coach to win his opener in his first season. The team went on to win its next six games, including wins over Willingham's alma mater, Michigan State, and Stanford, his former team. The team was initially led throughout the season by quarterback Carlyle Holiday, former quarterback and wide receiver Arnaz Battle, and on defense, Shane Walton. Running back Ryan Grant, who had to replace Julius Jones who was out for academic reasons, also played an important role. During the Michigan State game, however, Holiday was injured and replaced by backup Pat Dillingham. Dillingham led the Irish to a comeback win on a screen pass to Battle in that game, and he continued the winning streak until Holiday returned for the Florida State game. In that game, Holiday he threw a 65-yard touchdown on his first play to Battle that helped the Irish win the game. The first Irish loss of the season came against the Boston College Eagles, mirroring the 1993 season when Notre Dame narrowly lost a chance to participate in the national championship game due to a loss to Boston College. Willingham, wanting the team to be a part of the "Sea of Green" in the stands, decided that the team should wear green for the game. In 1985, the last time the Irish wore green at home, they came out after halftime against USC and won the game 37–3. The ploy, however, did not work this time, as, after an injured Holiday was replaced by Dillingham, and the Eagles defense returned an interception that sealed the loss for the Irish. The Fighting Irish won their next two games, including their 39th straight victory over Navy and a 42–0 blowout victory over struggling Rutgers. This gave Notre Dame a legitimate shot at a Bowl Championship Series (BCS) bowl game if they could win against perennial rival USC. The Irish were ranked higher than the Trojans, but USC quarterback Carson Palmer, who cited the game as the reason he went on to win the Heisman Trophy, threw for 425 yards in the Trojans' 31 point win. The Irish won 10 games but were not invited to a BCS bowl game, and they accepted a bid to play North Carolina State in the Gator Bowl instead. With both an offense and defense that outmatched the Irish, the Wolfpack won the game 28–6, giving the Irish their sixth consecutive bowl loss. Despite the loss, the Irish ended the season ranked in both the Associated Press (AP) and Coaches Polls. After the season, some Irish were honored with post-season awards. Battle was named by one foundation as their sportsman of the year, while Walton was named as a Consensus All-American. Finally, Willingham was honored with two Coach of the Year awards, was named by Sporting News as "Sportsman of the Year", and was the only coach listed by Sporting News as one of their "Most Powerful People in Sports". #Rankings from AP Poll. All times are in Eastern Time. 1 2 3 "2002 NCAA Football Rankings – Postseason Week 3 (Jan. 5)". ESPN. January 5, 2003. Retrieved February 18, 2008. ↑ Barra, Allen (September 27, 2002). "Notre Dame's return to glory! (Part 23)". Salon. Retrieved August 24, 2007. ↑ Krivickas, Justin (October 2, 2002). ""The Shirt" makes a return to glory". The Observer. UK. Retrieved August 24, 2007. ↑ "SI Covers". Sports Illustrated. Retrieved August 24, 2007. ↑ "Irish defense scoring all the touchdowns". ESPN. September 7, 2002. Retrieved August 23, 2007. ↑ "Notre Dame 22, Maryland 0". UND.cstv.com. August 31, 2002. Retrieved August 23, 2007. 1 2 "Irish Rally To Stop Spartans, 21–17". UND.cstv.com. September 21, 2002. Retrieved August 24, 2007. ↑ "Fighting Irish Crush Cardinal, 31–7". UND.cstv.com. October 5, 2002. Retrieved August 24, 2007. ↑ "No. 6 Notre Dame Rolls Past No. 11 FSU, 34–24". UND.cstv.com. October 26, 2002. Retrieved August 24, 2007. ↑ "Post Game Notes". UND.cstv.com. November 2, 2002. Retrieved August 24, 2007. ↑ "No. 4 Irish Fall To Boston College, 14–7". UND.cstv.com. November 2, 2002. Retrieved August 24, 2007. ↑ "No. 9 Irish Come From Behind To Beat Navy". UND.cstv.com. November 9, 2002. Retrieved August 24, 2007. ↑ "No. 8 Irish Rough Up Rutgers, 42–0". UND.cstv.com. November 23, 2002. Retrieved August 24, 2007. ↑ "Palmer wins every region except Midwest". ESPN. December 16, 2002. Retrieved March 10, 2009. ↑ "No. 7 Irish Fall To Trojans". UND.cstv.com. November 30, 2002. Retrieved August 24, 2007. ↑ "No. 11 Irish Fall To No. 17 NC State In Gator Bowl, 28–6". UND.cstv.com. January 1, 2003. Retrieved August 24, 2007. ↑ "Arnaz Battle Named Independence Bowl Foundation Sportsman of the Year". UND.cstv.com. December 18, 2002. Retrieved August 24, 2007. ↑ "Shane Walton Named Consensus All-American". UND.cstv.com. January 3, 2003. Retrieved August 24, 2007. ↑ "Tyrone Willingham Named Home Depot National Coach Of The Year". UND.cstv.com. December 9, 2002. Retrieved August 24, 2007. ↑ "Tyrone Willingham Wins George Munger Award for College Coach of the Year". UND.cstv.com. December 13, 2002. Retrieved August 24, 2007. ↑ Bock, Hal (December 11, 2002). "Willingham named Sporting News Sportsman of the Year". Centralohio.com. Archived from the original on September 27, 2007. Retrieved August 24, 2007. ↑ "Willingham Listed As One Of The Most Powerful People In Sports". UND.cstv.com. January 13, 2003. Retrieved August 24, 2007.